The individual blocks in this colorful throw are cleverly arranged so that the inside color of one matches the outside color of the next. 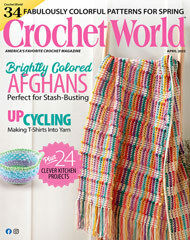 This e-pattern was originally published in the January 2011 issue of Crochet! magazine. Size: 57" x 57". Made with bulky (chunky) weight yarn and size I/9/5.5mm hook.